Oracle API Gateway is a standards-based, policy-driven, standalone software security solution that provides first line of defense in Service-Oriented Architecture (SOA) environments. It enables organizations to securely and rapidly adopt Cloud, Mobile and SOA Services by bridging the gaps and managing the interactions between all relevant systems. Oracle Web Services Manager(OWSM) is generally used for application security of a particular service,most customers have any use cases around DMZ or Perimeter Security for Web Services. This product serves as a part of the enterprise security solution. and route the requests only once those checks have passed. This may also be a typical use case for Mobile Applications which use REST Web Services at the backend. I have seen a strong value in this security product for all SOA and Mobile projects. – Authentication, Authorization (Leverages existing LDAP like AD ; existing IDM platforms for this – RSA AM, CA Site Minder, Oracle Access Mgr) Read the complete article here. Recently I participated of a project with Oracle API Gateway it uses Oauth2.0 for authenticate and authorize partners to call some APIs. The flow is simple, the partner calls the OAG through method POST with client ID and secret ID and then return the access token with scopes. This works well while it was in Development environment with single node Gateway, but when it runs in UAT environment with two nodes Gateway not in the same machine, the client reaches node 1, everything goes well and OAG/OAuth can authenticate the user. In node 2, however, OAG can’t find the OAuth client_id and the authorization is denied. 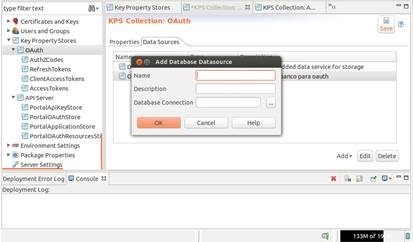 Oracle Api Gateway by default installs and uses Cassandra database for store token, access code and client for authorization. When it need to distribute through two nodes is required a shared structure to store this information. 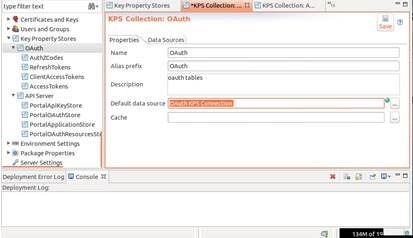 This article describes how to create the new shared structure using the Oracle Database. 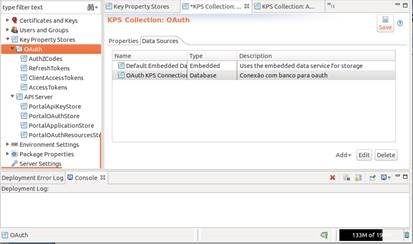 URL : jdbc:oracle:thin:@myenvironment:1521:xe and after click Test Connection, you should to see Test Connection OK.
4.2 – Select the option Database, write the name “OAuth KPS Connection” and Database connection choose the value created at step 3 “OAuth KPS Database” and OK.
4.3 – Back to tab properties option “Default Data Source” select item created at step earlier “OAuth KPS Connection” after click Save. 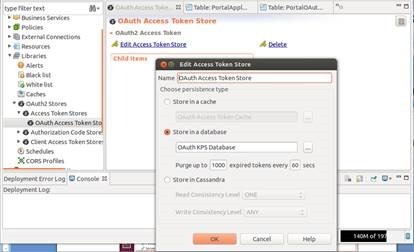 Go to option Libraries > OAuth2 Stores > Access Token Stores > OAuth Access Token Store, click Edit “Access Token Store“ and select “Store in a database“ choosing the item “OAuth KPS Database”. 8 – Test Configurations, Open Firefox and go to http requester plugin. 8.1 – Server 1 get token. 8.2 – Server 2 with token info. 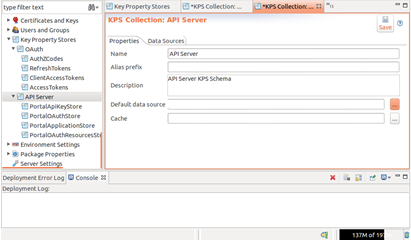 Call service https://server2:port/api/oauth/tokeninfo with token recovered at item 8.1. 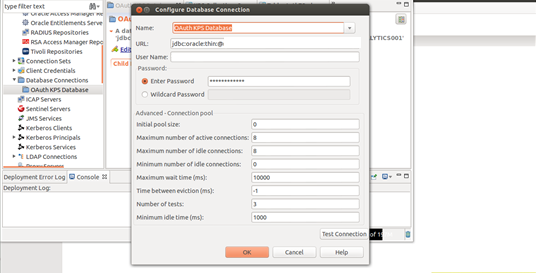 Now we be able to use Oracle API Gateway with two or more nodes, sharing the same Database repository.